Newport Beach, CA, November 07, 2011 --(PR.com)-- GemFind - http://www.gemfind.net - announced today the launch of the mobile platform version of their popular online tool, GF Diamond Link, allowing jewelry professionals to showcase the entire inventory of more than 70,000 loose diamonds in the GemFind.net network on an iPhone or Android. The new app gives jewelry professionals access to billions of dollars worth of diamonds from a mobile device. The diamonds can also be marked up as much as the jewelry professional desires. The new GF Diamond Link mobile app uses state-of-the-art diamond-search technology allowing users to find certified loose diamonds of any shape, size, color and clarity directly from their iPhone or Android. Users can search for any type of diamond cut - Asscher, emerald, heart, marquise, oval, pear, princess, radiant, round by price range and certificate type. “The new GF Diamond Link app for iPhone or Android is an easy, convenient and extremely affordable way for jewelry professionals to expand and sync their mobile device diamond inventory with their website virtual inventory,” said GemFind CEO Alex Fetanat. “It allows our clients to substantially increase their profits by providing greater inventory access without having to buy additional diamonds. Simply choose which diamonds you would like to display from more than 50 diamond suppliers and then easily set mark-up values to match your in store or online pricing structure. This is a perfect way to leverage on the inventory of the diamond suppliers,” concluded Fetanat. The GF Diamond Link iPhone and Android app integrates seamlessly into existing websites supported by mobile platforms and activates immediately with no equipment to buy or maintain. While the GF Diamond Link mobile app for iPhone and Android allows users to choose which diamonds will be displayed in their virtual showroom and allows them to adjust the price on diamonds and can easily integrate to shopping carts – the web application also includes the added benefit of a ring builder so customers can design their own pieces. Visit http://www.gemfind.net for more information or call 800-373-4373. Since 1999, GemFind (http://www.gemfind.net) has been successfully uniting diamond dealers, gemstone dealers, designers, jewelry manufacturers and retail jewelers in a vertically integrated data distribution channel via the Internet. 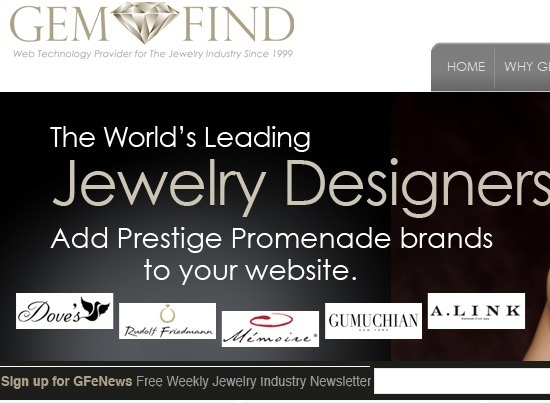 The GemFind Network is a membership organization that offers comprehensive online sales and marketing solutions connecting the virtual inventories and brand messaging of diamond and jewelry vendors to the websites of their authorized retail jewelers. From complete e-commerce and custom designed websites to virtual diamond and jewelry links which are embedded in existing websites, members form their own relationships and utilize GemFind’s proprietary double permission system to facilitate greater business with each other.